Attention Dinophiles: New Exhibit Opening in Pittsburgh, Pa. The exhibit, which opens to the public on Nov. 21, showcases dinosaurs in precise reconstructions of their ecosystems, interacting with their environments and the other animals and plants that lived alongside them. The new permanent exhibit replaces the former Dinosaur Hall, which opened in 1907 and closed to the public in March 2005 to begin a massive $36 million renovation and expansion. 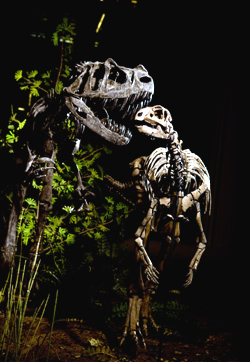 The Carnegie Museum of Natural History expect a visitor increase of approximately 40 percent (100,000 people) during the first six months Dinosaurs in Their Time is open. To minimize wait times, the museum has implemented a timed ticketing system. Furthermore, to allow visitors to bypass lines at the admissions desk, the museum offers advance ticket sales online at www.carnegieonline.org/cmnh/.